In 2018, Jaeger-LeCoultre launches six new watches celebrating the brand’s historic Polaris. The original Memovox Polaris, a beefier, sportier version of the already-classic Memovox alarm dress watch, was launched in 1965, during a time that could be described as the golden age of ocean exploration (and, accordingly, diver’s watches). Only 1,714 Memovox Polaris models were manufactured between 1965 and 1970, equipped with a variety of dial and hand styles and aesthetics. Robust functionality was the main characteristic of the Polaris – including water resistance to 200 meters – deftly followed by tasteful legibility. In 2008 Jaeger-LeCoultre released two re-editions outfitted with a synthetic glass material to replicate the boxy look of the cambered glass used on the original. The brand-new 2018 line (naturally now outfitted with sapphire crystal) docks into the history of the handsome diver’s watch that is unmistakably Jaeger-LeCoultre, and it seems perfect to me for the needs of 2018’s consumers. In fact, the new line takes the Memovox Polaris and stretches it to encompass everything an everyday watch could comfortably offer for the modern lifestyle. And most importantly this line of six watches is both elegant and sporty at the same time – as evidenced by the dial architecture, which combines finishes in three concentric circles: sunray in the very center, graining outside of that, and an opaline finish on the signature rotating bezel underneath the crystal. And each watch is available with a choice of black or ocean-blue dial. The hands on each of these dials are filled with Super-LumiNova for optimal visibility, and the two most vintage-inspired models, the Polaris Date and the Polaris Memovox, even boast old-style vanilla-colored Super-LumiNova to mimic tritium. The six cases boast a fresh design with new proportions featuring a combination of brushed and hand-polished surfaces, thin bezels, and sharper lugs. The crowns have also been redesigned to become larger and more easily gripped. But perhaps my favorite new feature is the interchangeable strap system, allowing the owner to switch between more formal alligator, comfortable calfskin, and sporty rubber in the blink of an eye. Why a new Polaris collection? 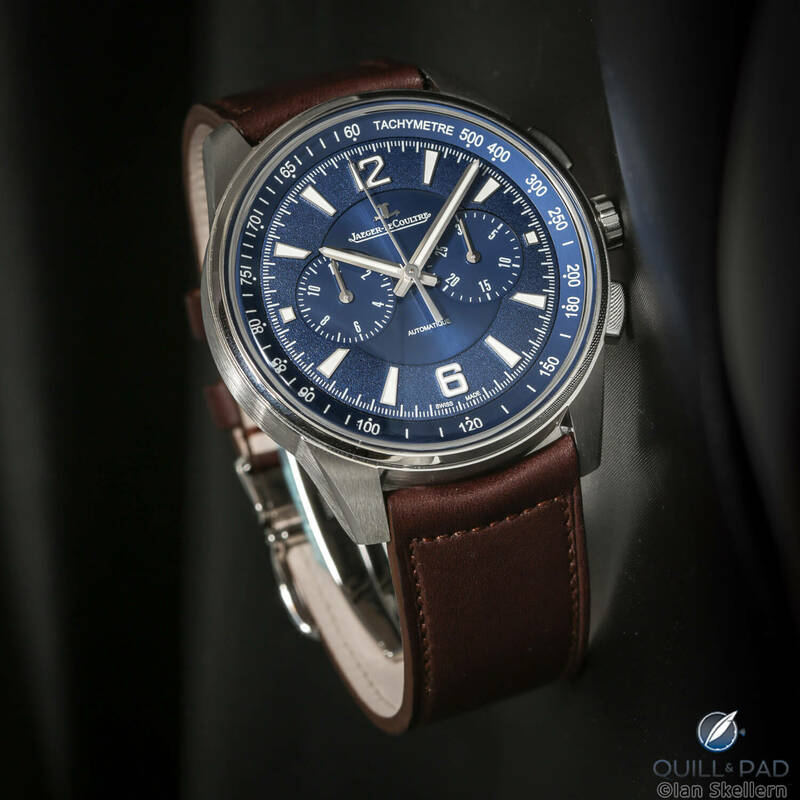 Geoffroy Lefebvre, deputy CEO at Jaeger-LeCoultre, talked to me about why the brand decided to launch a whole new line and who the consumer of it is. “Our customer is a connoisseur, a person who is sophisticated and likes fine things, who doesn’t like bling and is understated, but likes to know where things were made and how they were made,” he explained. How does this new collection differ from the original? “It’s definitely a new movement versus what we had in 1968, and the case is a bit different as well. The crowns have been completely reworked so that they integrate well into the entire collection. Otherwise it’s really faithful, it has the two crowns; one controls the power reserve for the alarm, the alarm time, and the date. The other one manipulates the inner bezel. All Polaris models, even the simple automatic, have the inner bezel,” Lefebvre continued. Visiting multi-brand points of sale, it’s not hard to see how many timepieces are available to the consumer; it can be downright confusing to pick out a new luxury watch. “That’s why effort has to be toward rationalizing our collections, making them more legible, easier to read, easier to understand, and easier for us to explain,” said Lefebvre. “I think the future goes with simplicity. The new version of Jaeger-LeCoultre’s diver’s icon benefits from the manufacture’s latest technical innovations in precision, robustness, and reliability. Thus, it is powered by automatic Caliber 956, featuring a gong placed at the back of the case and an instantly jumping date-change system. Measuring 7.45 mm in height, it beats at a frequency of 4 Hz (28,800 vph). The rotor swings along ceramic ball bearings that require neither maintenance nor lubrication. While the historical Memovox Polaris had a three-part case that included two inner cases – one in bronze to enhance the alarm’s resonance and one drilled with 16 holes to prevent the sound from muffling into a wetsuit – the tribute models are outfitted with an inner, sealed case back that retains its role as a resonance chamber. This is made possible thanks to the fact that the gong now has a different position within the movement and that there is an outer case back with the 16 openings to allow the sound out. 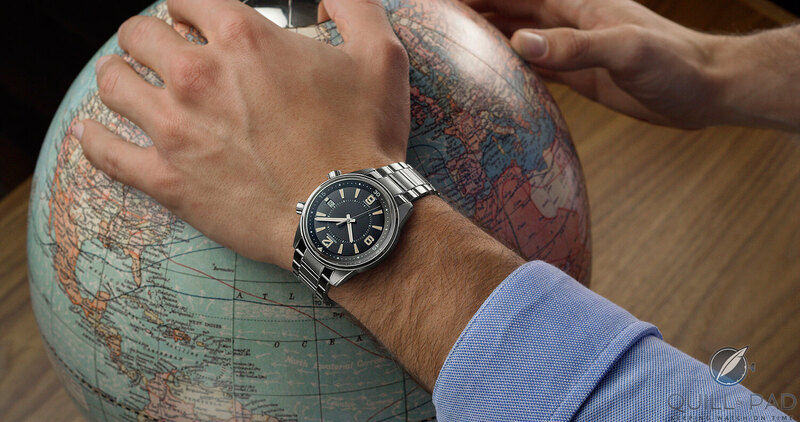 The Polaris Date is distinctly vintage inspired, and this is a good thing because the Polaris was one of the most attractive diver’s watches around. The Polaris Chronograph with world time is currently the only titanium-encased watch in this lineup. And the Polaris’s hallmark second crown is put to good use here: it turns the rotating inner bezel with the world time cities. An elegant chronograph, this is the only precious metal model in the new Polaris collection. It’s no secret that Jaeger-LeCoultre made dashboard instruments for cars in the early days of the automobile – and this steel chronograph displays its motor sports inspiration right up front. The dual crowns add a bit of pizzazz to the time-only timepiece, one for time setting and one for rotating the inner bezel, which allows the wearer to take a timing measurement. All of these watches are available in Jaeger-LeCoultre’s e-boutique as of January 15, 2018. The watches are crafted with so much care. How comes, the text has two real big careless misses concerning the crowns?